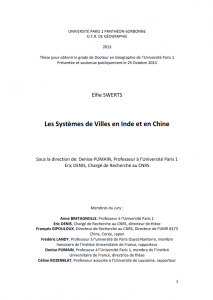 Swerts E., 2013, The Indian and Chinese Systems of Cities , University Paris I.
Abstract. This thesis compares the urban systems in China and India using dedicated data bases that have been constructed using comparable and harmonized principles, describing the evolution of the population of all urban agglomerations above 10 000 inhabitants, every ten years from the beginning of 20th century for India and 1964 for China. Both very large countries of ancient urbanization are characterized by many small towns and have developed gigantic metropolises during the last decades. Despite their geo-historical specific features, these two systems share with others in the world the same properties of hierarchical differentiation and urban growth processes (Zipf’s law and Gibrat’s model), at country scale as well as for regional subsystems. A regional diversity is linked to former processes of unequal concentration of urban development. The most interesting result is identifying for the first time a reverse trend in the evolution of the Chinese urban hierarchy compared to other countries in the world among which India: despite the very rapid recent urban growth, the inequalities in city sizes are decreasing. This may in part depend of the under-registration of migrant urban populations. It also reveals the power of the political control on China’s urban processes that also appears in the magnitude of spatial concentration of manufacturing cities due to the implantation of Special economic Zones. Comparing the trajectories of Indian and Chinese cities may well improve the prospect of global urbanization that is crucial for the world and the planet. Key-words. System of cities, Urban hierarchy, Zipf, Gibrat, Urban trajectories, China, India. Cottineau C., 2014, The evolution of cities in the post-Soviet Space. 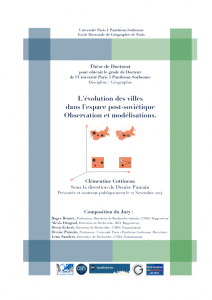 Observation and modellings, University Paris I.
Abstract. 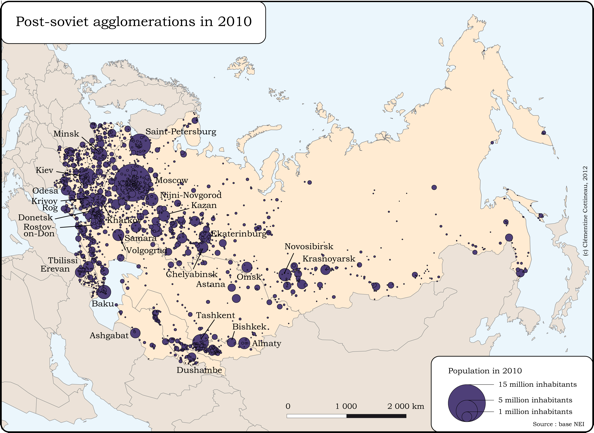 The Russian and Soviet urbanisation process happened late and fast, compared to other territories. Many new towns and cities were created by the Soviet regime that officially promoted discourses about the socialist function of the city, rational organisation of space and a planned management of the economy. These urban particularities and the multiple demographic and political events of the 20th century have made cities in the post-Soviet space an interesting case and raised question regarding its ruptures and comparability. This dissertation thesis aims to show that the concept of system of cities and generic methods in urban geography (especially models) are useful in the study of urban evolution over the long term in this space, to eventually better understand past trends and predict future ones. We confronted several statistical models with the observed urban dynamics and concluded that the macro-geographical structure of cities in the post-Soviet space was comparable to that of other systems of cities (hierarchy of sizes, spacing, functional differentiation). We also observed specific trajectories related to the size of the territory, natural resources, the recent demographic shrinkage and the effect of particular political decisions. This knowledge about observed evolutions has been included in an incremental approach of agent-based modeling. Starting from theoretical hypotheses about generative mechanisms, we tried to generate generic and specific stylised facts, with a model as parsimonious as possible. The progressive evaluation of increasingly complex models led to the satisfactory simulation of observed urban evolution and highlighted specific trajectories that “resist” modeling. Key-words. System of cities, Post-Soviet Space, Soviet Union, Generic/Specific, Simulation, Urban evolution, Urban growth. 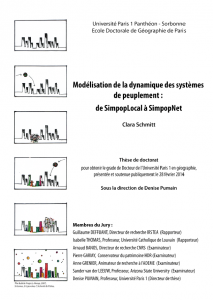 Schmitt C., 2014, Modeling settlements systems dynamics : from SimpopLocal to SimpopNet, University Paris I.
Abstract. Is urban growth the result of multiple interactions between cities ? Urban evolutionary theory (Pumain, 2000), based on this postulate, analyses urban growth processes. This thesis, undertaken in an inter-disciplinary context, aims to evaluate the validity of the hypothesis by means of computer simulation. Strong regularities of the urban systems dynamics are extracted from the accumulated scientific knowledge and synthetized into ten major stylized facts. Two simulation models, SimpopLocal and SimpopNet, are then built, documented – thanks to a standardized grid – and systematically explored. They each question a specific aspect of the urban evolutionary theory : the nature of the inter-urban interactions for the first model (i.e. competition for innovation) and their support for the second model (i.e. the role of the communication network structure). The evaluation of the two models required the design and the implementation of two original exploration protocols : an automated calibration method and a sensibility analysis protocol (the Exploration Profile algorithm) which individually evaluates the contribution of each implemented mechanism to the simulated behavior. These two forms of exploration systematically confront the simulation results with current scientific knowledge. They indicate that the two models are able to account for key processes of urban systems dynamics, such as their hierarchical organization, and demonstrate for the first time the need for interurban interaction mechanisms in order to simulate urban evolutions that are close to those observed on real urban systems. Key-words. System of cities, Urban systems, Simpop, SimpopLocal, SimpopNet, Simulation, Urban evolution, Urban growth. 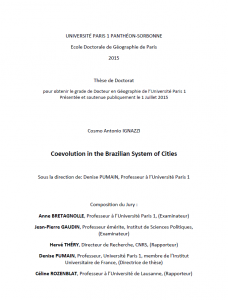 Ignazzi C. A., 2015, Coevolution in the Brazilian Urban System, University Paris I.
Abstract. 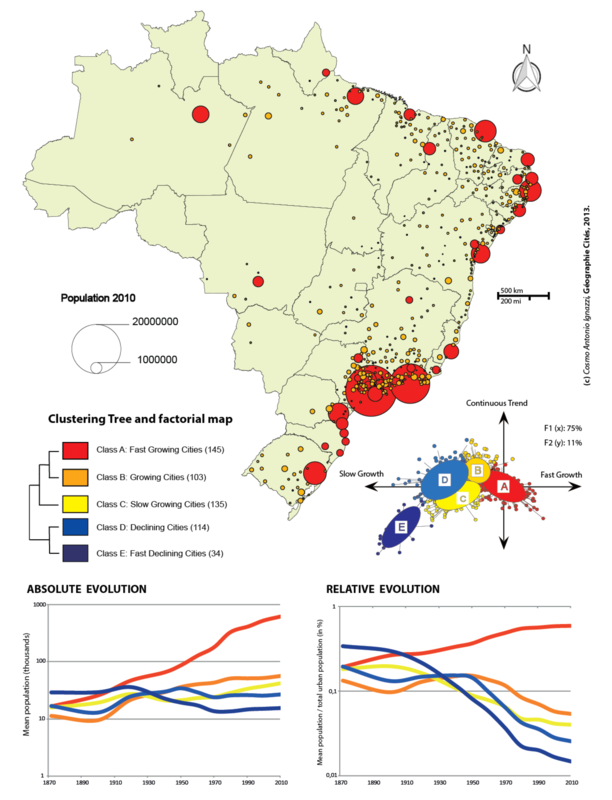 This thesis analyzes the urban system in Brazil adopting an advanced database that have been constructed collecting demographic data in order to examine the evolution of the population of all Brazilian agglomerations since the first Brazilian official census carried out in 1872 until 2010. The largest country of South America has already completed its urban transition during the last century and is characterized by the contrast between a larger number of small towns throughout the immense territory and enormous Metropolitan areas dominating the system of cities. Despite its geographical and historical peculiarities, this system shares with others in the world the same properties of hierarchical differentiation and urban growth processes (Zipf’s law and Gibrat’s model). Economic data have been integrated in the database with the aim of testing the validity of scaling laws for Brazil and performing robust statistical analysis in order to explore the functional differentiation of cities, their economic performances and the spatial autocorrelation processes occurring among them. The most interesting result is characterizing the Brazilian urban hierarchy over the long period and measuring the increasing inequalities in city sizes. Moreover, the parallel support of demographic and economic data is essential to identify the connection between population and economic growth in one of the most urbanized country of the world. Key-words. System of cities, Urban systems, Urban hierarchy, Zipf, Gibrat, Urban trajectories, Brazil, Functional differentiation, spatial autocorrelation. 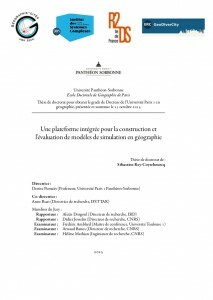 Rey-Coyrehourcq S., 2015, An integrated platform for building and evaluating model of simulation in geography, University Paris I.
Abstract. Since 1990’s, Agent Based Modelling are commonly used by geographers to study complex systems like cities. However, very few technical platforms are advanced by searchers to assist in the construction and evaluation of models of simulation. With the help of ERC program GeoDiverCity and the formation of an expert interdisciplinary team, we try to solve these problematic following two objectives. Relying on the support of OpenMOLE platform developed at the Institute of Complex System Paris-Ile-de-France in order to make it simple the distribution of simulation on distributed computing environments, we identify, use or build new tools and methodology to construct and explore model of simulation. To anchor this work in practice, we use this platform to build and explore a new model of simulation: SimpopLocal. This very practical work is accompanied by an historical and epistemological reading of simulation, and the means of simulation in geography. These contextualisation permits us to examine, and perhaps to anticipate, the historical link between the old problematic of “Validation”, very important to consider for knowledge justification, and the building and exploration of models of simulation. Key-words. Simulation, Agent Based Modelling, Complex systems, Distributed computing environments, Validation. 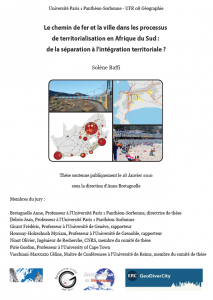 Baffi S., 2015, Railways and city in territorialization processes in South Africa : from separation to integration?, University Paris I.
Abstract. First railway network in Africa, the South African Railways constitute a privileged marker of the territorial mutations that have been shaping this country for decades. The radicalism of political systems shows through the persistency of segregative schemes of which the railways, as part of the planning toolbox, are one of the elements. The inertia of this infrastructure questions its re-appropriation and insertion into the various planning projects over the long term. This thesis approaches the long-term dynamics of ‘territorialisation’ in South Africa through the prism of railways. This study focuses on the interaction between cities and the railway network, at both the interurban and the intra-urban levels. In order to understand this interaction, cities’ location and railways diffusion patterns are analysed, with a specific emphasis on the shape of the network. Indeed, through their pattern, railways express the intentions of actors in charge of planning at the national level. By the flows it supports and the mobilities it enhances, it gives us information on the socioeconomic requirements of society and the power relations it contains. Thus, this thesis relies on a qualitative and quantitative approach aiming to outline the structuring effects of the railways in South Africa over the long term. Its political use by successive segregationist powers explains partly why nowadays railways keep on marking partition in the post-apartheid urban space and in the practices of city dwellers. However, the recent rail renewal observed in the metropolises, Cape Town in particular, might indicate a possible major inflection in the persistency of inherited dynamics. Indeed, the evolution of the rail offer demonstrates a shift towards a co-construction trend between South African society and urban planning unheard of until now. Key-words. System of cities, Urban system, South Africa, Railways, Territorialisation, Inclusion/exclusion, Intra-urban mobilities. 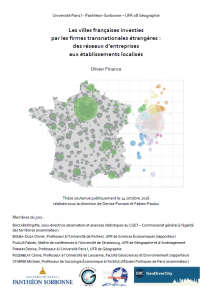 Finance O., 2016, French cities hosting foreign direct investments: from networked companies to localized establishments, University Paris I.
Abstract. Transnational corporations, which are amongst the major players in the contemporary global economy, integrate and exclude territories at various scales, due to their specific location strategies. These inequalities are well known at an international scale, yet the knowledge of this diverse integration is much more limited regarding urban levels, although cities and metropolises are considered as being the major nodes of the globalized networks. France and the OECD countries certainly appear in central positions in the networks that characterize these corporations, but observations made at the urban level remain very partial due to the lack of localized data. This thesis suggests to both approach and localize conventional data about Foreign Direct Investment (FDI) in the French case by mobilizing data about financial links connecting economic units. The detailed breakdown of transnational corporations affiliation networks has been conducted up to the level of the establishments, which are the real individual economic and geographic cells of these transnational networks. An original database about localized inward FDI stocks has been built and explored to appreciate how far foreign transnational corporations integrate the 355 main cities into the French urban system. These data revealed the diverse integration of French cities, between dependence and attractiveness for the investors. The mobilization of scaling laws, which constituted a major analytical tool in this work, allowed us to identify the major factors explaining the diverse integration of French cities into the whole system of cities, reflected both by inequalities of hierarchical and regional order. Key-words. System of cities, Urban system, France, Scaling laws, Foreign Direct Investment, Transnational firms. How to estimate the singularity of (post-)Soviet cities? New Article, in RERU – Revue d’Économie Régionale et Urbaine. 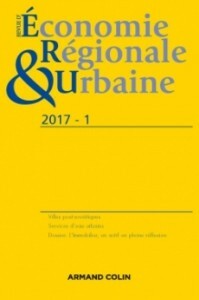 Cottineau C., 2017, “How to estimate the singularity of (post-)Soviet cities?”, Revue d’Économie Régionale et Urbaine, n°1-2017. Abstract. Although the urbanisation of the Former Soviet Union is a unique experience, this article questions the possibility of estimating the share of the generic processes of urban growth, spatial location and economic specialisation, the share of the particular processes of urbanisation linked to the size and political organisation of the country, and the share of the singular processes that cannot be explained without a local knowledge of the events which happened in the cities under study. Using several types of models at different scales, we identify the residual as the element that “resists modelling” and illustrates the singular evolutions of the Soviet Union and its cities. To do so, we built a harmonised urban database and fitted hierarchical, spatial and regression models. We conclude that city size inequality increased in a generic manner compared to other systems of cities, that the spatial distribution of cities resemble that of vast countries (especially with the increased reliance on sub-surface resources), and that there exists a set of singular urban trajectories. Key-words. System of cities, Soviet Union, Singularity, Models, Urban growth, Urban trajectories, Urbanization. New Article, in Cybergeo, European Journal of Geography. Abstract. This article analyzes the dynamic of Brazilian system of cities illustrating the growth of Brazilian population through its own historical peculiarities like internal and international immigration, industrialization, metropolization. Urban hierarchy is revealed by means of the Zipf’s law and Gibrat’s model is used to describe the mechanisms of urban growth. Deviations from this model were explained by studying the specific trajectories of five different classes of cities, on various time scales (from 1872 to 2010 and from 1960 to 2010). These deviations highlight different kinds of factors (political, economic, localization of resources and historical accidents) that shaped the Brazilian system during the last century. Key-words. Spatial autocorrelation, Urbanization, Brazil, Urban Hierarchy, Trajectories, Zipf’s law, Gibrat’s law, Markov Chains. > Session : 1654 European Research Council – Top European grants for brilliant minds from across the world, from 4:40 PM – 6:20 PM in Grand Salon C, Marriott, Second Floor. Organizer : Katja Meinke. > Session : 2268 Urban systems and scaling laws: Functional diversity and urban economic trajectories, from 10:00 AM – 11:40 AM in Meeting Room 1, Marriott, Second Floor. Organizer : Céline Vacchiani-Marcuzzo. > Session : 2239 Geosimulation Models 1: Methodological Advances, from 10:00 AM – 11:40 AM in Room 39, TCC, Fourth Floor. Organizers : Paul Torrens, Suzana Dragicevic, Andrew Crooks. > Session : 2539 Geosimulation Models 3 : Applications – Macro, from 2:40 PM – 4:20 PM in Room 39, TCC, Fourth Floor. Organizers : Paul Torrens, Suzana Dragicevic, Andrew Crooks. Denise Pumain, 2012, “Urban systems and global dynamics”, Global Systems Science Conference, Brussels, Nov. 8-10th. In the context of GeoDiverCity, generic properties of city systems are looked for as stylized facts that apply to these particular objects over the world and over time. Examples of those properties lay in the hierarchy of city sizes (expressed by Zipf’s law), or the process of urban growth (as described by Gibrat in 1931). Using those regular patterns, modeling of the co-evolution of cities becomes possible and useful. Russian cities oppose several obstacles to the observation of such regularities. The spatial limits of the system varies over time, which complicates the choice of urban definition, and the collection of reliable data. Moreover, the historical object of Russia and the Soviet Union exhibits strong specificities related to its (supposed absolute) control over urban definition, development, interactions and inner organization. Our work aims at distinguishing the specific from the generic behavior of the Russian system of cities from the urban transition up to now, in order to model its evolution and propose possible projections with the help of Multi-Agent Models. This project 1 begins with the harmonization of urban definitions. Theoretical and data collection constraints led us to consider agglomerations of 10.000 inhabitants and more between 1840 and 2010. Agglomerations have been composed of administrative units which take part in the same built-up area in 2010. Since the boundary of the system is not obvious over the XIX and XXth centuries, its larger extension (the Former Soviet Union) is tested along with its present configuration (the Russian Federation). Generic models (Zipf, Gibrat) are tested and compared with the results obtained in other geographical contexts. Europe, North America, South Africa, India, China and Brazil are represented in the research fields of GeoDiverCity, sharing the same principles of data harmonization, which helps us in the process of comparison. Other tools are used to explore and explain the specificities of the system of Russian cities (analysis of urban trajectories and financial links between cities with the ORBIS Database produced by Bureau van Dijk, 2010 and augmented by C. Rozenblat). The characteristics of the Russian system learned from these studies, coupled with the experience accumulated within Géographie-Cités and GeoDiverCity will help modeling the system and simulating its possible futures. Cities are becoming the habitat of more and more people in the world. All cities are connected by a multitude of networks that make their evolutions becoming more and more interdependent. Our aim is to provide medium-term forecasts of the way in which the urban systems of different continents will evolve, and to explore scenarios whereby these city systems might adapt to the global changes they contribute to shape. This research programme sets out to gather the main stylised facts making up our knowledge about the dynamics of complex urban systems that has been acquired from observation and different analytical modelling processes, and to use them in new simulation models so as to reconstruct the interaction networks making up these systems. These models will be validated using a multi-scale procedure based on temporal geo-referenced data bases and a new interactive simulation platform.